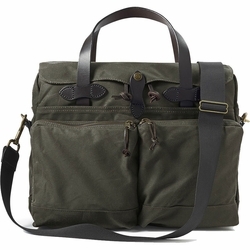 Filson 24 Hour Tin Briefcase. Water-repellent Tin Cloth briefcase with multiple pockets. Designed for all weather conditions, this water-repellent Tin Cloth briefcase is fully lined and features an interior laptop divider, removable shoulder strap, multiple pockets and trolley strap to loop over luggage handles.